Why are Family Trees depicted wrongly? Something that has bothered me for a long time has been the depiction of our ancestors perched in a "family tree." As an example, here is a nice graphic from http://www.nalw.org/. 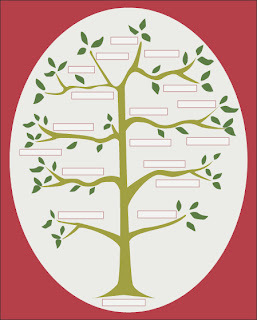 To fill this tree out, you put a living person or a recent ancestor at the bottom position on the tree, and then add parents above them, grandparents above them, great-grandparents above them, and so on. The earliest ancestors are higher up in the tree. Descendants are shown below the ancestors higher in the tree, which has some logic to it. Of course, the graphic above doesn't even have all of the boxes in the right place! But then we talk a lot about "ROOTS." Our family "roots" are these same ancestors that we perched high up in the tree. To me, the "family tree" should be depicted with "roots" (ancestors) below the selected person and "branches and leaves" (descendants) above the selected person. There are some graphics like that available, like here, that put the ancestors below the ground. Isn't that where our ancestors really are? Almost all of them are below the ground, not up in the tree! I haven't looked for graphics in software programs other than FTM 2005, so there may be some more graphics out there that depict ancestors below the ground and descendants above the ground. I guess maybe I should stay away from graphic depictions of "family trees" that don't show "roots." Why do they depict the tree this way? I think it is because we want an ordered graphical depiction of our ancestry. Branches and leaves are brown and green and pretty, roots are dark and gnarled and semi-ugly. We know how many people are in each generation and so the "family tree" above the ground can have a set number of branches and leaves. If we put descendants above the ground in the graphics, then each tree would be different - some families have many children, and some have only one or none. It would be difficult to show 4 or 5 generations of ancestors below the ground and 4 or 5 generations of descendants above the ground on one piece of paper without small print. Perhaps an hourglass chart with a family tree graphic (leaves, branches, trunk and roots) as a background would be the best we can do. Perhaps the better terms would be "progenitors" for ancestors" and "progeny" for "descendants." Then we aren't (I'm not) confused by "ascending" and "descending. " I guess it is my scientific, engineering and Presbyterian mentality that requires "order" above all. It has always bothered me for some reason. Is this a symptom of geneaholism? Probably. Who me, worry?